Key challenges facing the large-scale deployment of CCS include technology, costs, financing, public acceptance and legal and regulatory issues. This report, authored by Naser Odeh and Heather Haydock for the Near Zero Emissions Coal project, is concerned with the regulatory and legal issues facing CCS deployment in China. 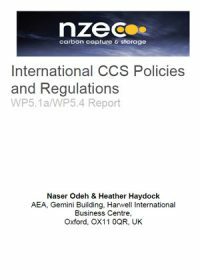 The report reviews the status of CCS regulation worldwide covering the various stages of a CCS project life cycle including carbon dioxide (CO2) capture and CO2 transport in addition to the injection and post-injection phases.